This fruit dip is so easy to make and is a welcomed addition to any afternoon snack. It tastes great with apples and bananas and it’s pretty healthy! In a food processor combine yogurt, peanut butter, cream cheese, vanilla, honey and cinnamon; pulse until smooth. 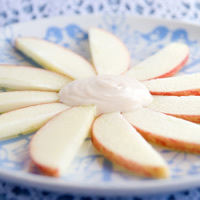 Serve fruit dip with apples or bananas. Refrigerate for up to one week.